Google doesn’t make it mandatory for everyone to sign into YouTube for watching videos. However you must have stumbled upon few YouTube videos which will compulsorily require you to sign-in in order to view the video. 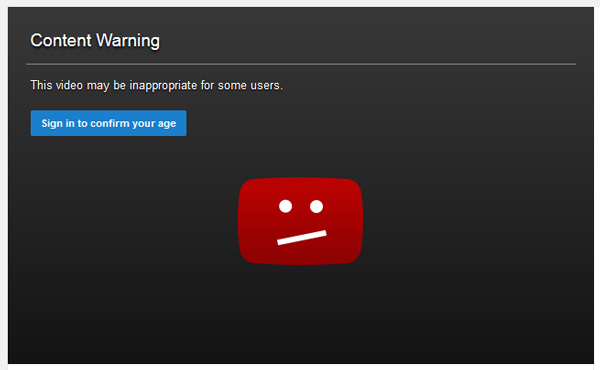 These video usually have age restricted content and in most cases these videos are not suited for minors. A few example of these videos would be video related to game trailers with violent content, sexual education, videos with language ..etc. However it’s not very hard to bypass the age-restriction. A simple URL edit is all that’s required to bypass the age restrictions and watch any age restricted YouTube video without even signing in into your YouTube account. For those who are interested, here’s how you can watch Age restricted YouTube videos without even signing into your YouTube account. Remove watch? from the URL and replace = with a / . This is how the change URL will appear. Now you can use this link to watch the age restricted video without even signing into your Google account and by default the video will start playing in full screen.